Amanda was an extremely fit fifty-something with a full-on family lifestyle and a high reputation as a competitive swimmer. Yet there was a nagging problem in her life that rendered it far from ideal. She had G cup size breasts. She describes it as “like having two bags of flour hanging round my neck”. The aesthetic considerations didn’t trouble her half as much as the prospect of carrying this load around for the next forty-odd years. Amanda had pondered the question of breast reduction surgery for around twenty years. She confesses being terrified by the thought of the knife but as time went by the discomfort she was suffering began to overwhelm the terror. Finally she summoned her ultimate reserves of courage and consulted her doctor. He recommended Dr Michael Yunaev – Specialist OncoPlastic and Cosmetic Breast Surgeon and Principal Doctor at Breast & Body Clinic. A friend of hers had opted to go to Thailand for breast reduction surgery but Amanda decided that when it came to her personal wellbeing, cheaper deals overseas were no match for engagement with the world-class expertise available in Australia. Amanda recalls that her terror had recurred by the time her appointment with Dr Michael came around so it was a welcome surprise that the confidence and reassurance he exuded soon put her at ease. 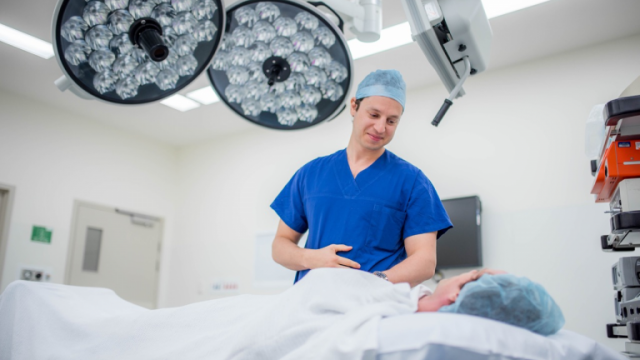 The decision to undertake breast reduction surgery is conditioned by many profound personal and sensitive issues and she was impressed by his ability to understand and empathise with them. When she left his consulting rooms she couldn’t believe she’d taken an on-the-spot decision to book the surgery in three weeks’ time. Amanda stayed just one night in hospital after the surgery and from that point her satisfaction and delight at the results have grown exponentially. She feels a burden has been lifted not just from her shoulders but from her whole life. The next forty years have suddenly become a much more exhilarating prospect. Whilst her prime motivation for breast-reduction surgery was not about appearance she admits to being pleased about the distinct improvement in that aspect as well. Her only negative reaction has been regret that she didn’t undertake the surgery twenty years earlier. Amanda’s advice to women contemplating breast reduction surgery is, first of all, do not hesitate like she did, and then ask your doctor for an introduction to a leading specialist in the field. Amanda believes there is no-one better than Dr Michael Yunaev. Patients benefit not just from his consummate surgical skills but also from his patient-centric emphasis. He strongly believes that optimum surgical outcomes depend on a deep understanding of individual patient needs and feelings. The comment from Amanda which left the deepest impression on him was “all I want to do is swim”. Dr Michael consults at a number of locations in Sydney and Bowral. For further information go to info@bbclinic.com.au or contact his rooms on (02) 9819 7449. Amanda is now looking forward not only to achieving her personal best swimming times but also to enjoying some of the best times of her life.